Bon Voyage! Be sure you’re travel planning is complete. What you need to know about Travel Insurance - Scarsdale Premier Insurance Agency | Advocate Brokerage Corp.
By morning you’ll have dropped the dog off at the kennel. By evening, your neighbor will pick up the mail and timers will turn on the lights in your home. You’re all set for the perfect vacation. There is nothing to worry about right? What happens if one of your family members is taken ill or dies before you leave? What if a monster storm hits on your departure day? What if the exotic location you planned to visit is suddenly the scene of political unrest? That’s silly. Those things won’t happen! You’ll have a great flight. What happens if you get really sick while you are abroad? What if your medical insurance doesn’t cover treatment in a foreign country? The U.S. Travel Insurance Association, which represents 90% of the trip-insurance market, reported that Americans spent $1.9 billion on insuring their travel last year. That’s a 50% increase from 5 years ago. There are different types of insurance to consider. 1 – Trip Cancellation Coverage. This is coverage comes into play with a trip cancellation, interruption or delay. The nonrefundable parts of your vacation would be covered if you experience any of the reasons listed in the policy. Read the fine print. Consider purchasing a policy that offers a cancel for any reason provision, which means that your reason for cancelling doesn’t have to be listed in the policy. 2 – Illness or Injury Coverage. Protecting yourself if you become sick or injured overseas is another reason to purchase a policy. If you have factors that could contribute to an injury while traveling, your son hiking Himalayas for example, you might want to purchase coverage of this type. Additionally, if your Dad has a heart condition that could escalate while visiting the sights in London, this type of policy is worth consideration. 3 – Travel assistance. Travel assistance is essentially a concierge service that finds doctors or contacts family members in the event of an emergency. If you have any lingering worry about this type of situation, the peace of mind may be worth it. 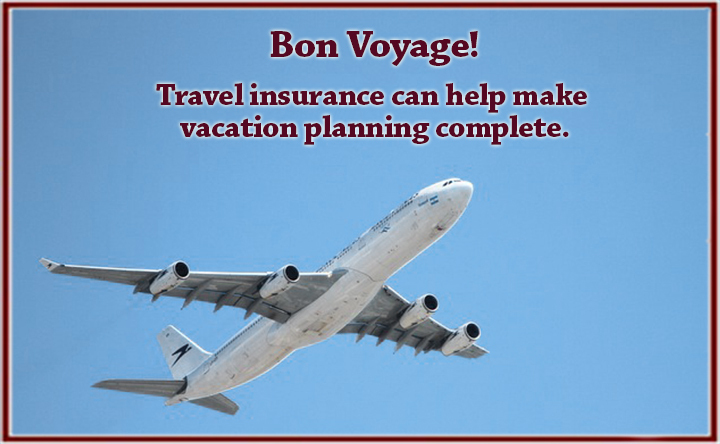 There are many other types of coverage you can purchase to ensure you are fully protected, so before you pack your suitcase, you might want to consider sitting down with your insurance agent to review what types of coverage would best suit your travel plans. 1 – You can also purchase a travel delay policy that covers your expenses due to minimal delays to or from your destination. These expenses may include accommodations, meals, extended boarding of your pet and the non-refundable pre-payments for the part of your cruise or tour you missed due to the delay. 2 – Older travelers need to know that Medicare doesn’t provide coverage outside of the U.S. If you have a catastrophic accident, you may have to be medically evacuated home from a distant country; this could cost as much as $30,000. Are you ready to put your mind fully at ease and enjoy the vacation you’ve spent so much time planning? Your Advocate agent would be happy to sit with you to make sure the coverage you have is sufficient and if not, recommend supplements to make your vacation truly one dreams are made of! Bon Voyage!